Curtis has been part of the CFCR hosting family for upwards of two decades. He began by doing the 6-8am shift on Green Eggs & Ham after a friend asked if he wanted to co-host with him. After a few years, they moved to an evening slot on Tuesdays and Fistful Of Booyah! was born. After a few more years, they moved to an open spot on Friday evenings. His co-host left a number of years ago, but Curtis kept on truckin’, and has been in the Friday 7:30-9pm time slot ever since, spinning a mix of rock n' roll, blues and lots of Celtic punk. 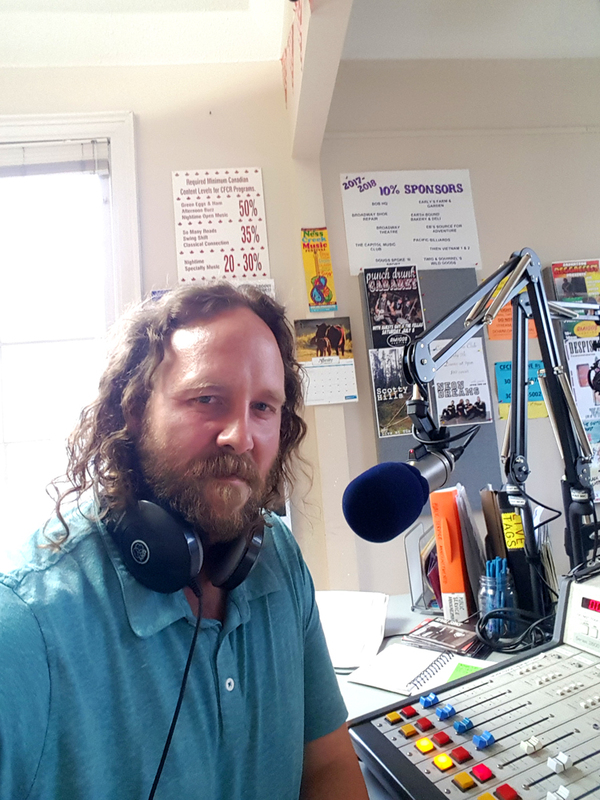 Curtis has decided it’s time to hang up the headphones on an illustrious volunteer hosting career, but we’ve got a fistful of appreciation for his contributions to CFCR’s airwaves. I was randomly flipping through stations while waiting for a friend at the University. When I got to the bottom of the dial I heard my first Frank Zappa song. It was the strangest thing I'd heard on radio so of course I had to hear more. I get to be on the radio and play music I personally enjoy, who wouldn't want to do that? CFCR is important because it's a way to find music you would have never even thought to look for. There's so much good music out there that will never be a hit or make a Top 40 chart. CFCR is a way to discover what else you're missing. I had someone phone in a song request while he was in jail. I wish I could remember the name of the band but I do remember liking the song. I've always had a soft spot for Sounds of Scotland. Nightwaves ranks up there for me too. It's hard to pick a favourite but locally I would say that Jordan Cook gets more airtime in my house than any other "local" band (I know I should call him Reignwolf, but for reasons I can't explain, I refuse). Non-locally, it's much harder to pick but I'm listening to a lot of The Dreadnoughts lately and bands like The Temperance Movement. Of course I do know almost every Great Big Sea song by heart (even the pop songs no one else seems to like) so they make the list too. I enjoy my perpetual fight to keep my lawn alive. Everyone needs an exercise in futility in their life. I also enjoy yelling at the TV when I'm watching reality shows, going to every superhero movie the industry can churn out (even the bad ones) and hanging out with my wife (she didn't make me write that, honest). Most favourite: Bacon followed closely by all the other meats. Least favourite: Vegetables. Although I will make an exception for banana peppers. Here's a list of tunes picked by Curtis. Check it out! The Dreadnoughts - "Gintlemen's Club"
Danko Jones - "Just A Beautiful Day"
Monster Truck - "Don't Tell Me How To Live"
The Real McKenzies - "Northwest Passage"
The Temperance Movement - "Three Bulleits"
Royal Deluxe - "Make a Little Money"